Dom: You don’t turn your back on family, even when they do. Director, Justin Lin took over the FAST AND FURIOUS franchise in 2006, with the overtly disappointing TOKYO DRIFT. Since the true horror of that experience, Lin has gone back to basics by delivering an adrenaline-filled plot that captures the essence of the FAST AND FURIOUS franchise. FAST AND FURIOUS 6 is a character driven tale of family and revenge, with loads of unspeakably insane action. This stretch of the franchise has been Lin’s baby and he truly has done great things with it, especially considering his particularly rough start. Introducing a movie, then backtracking and doing a three-part prequel is a risky move. (Yes, the last three films are in fact prequels to TOKYO DRIFT.) The move paid off though as FAST AND FURIOUS 6 truly highlights what this ever-growing franchise is really about: fast cars, family, and the lengths we will go for those we love. 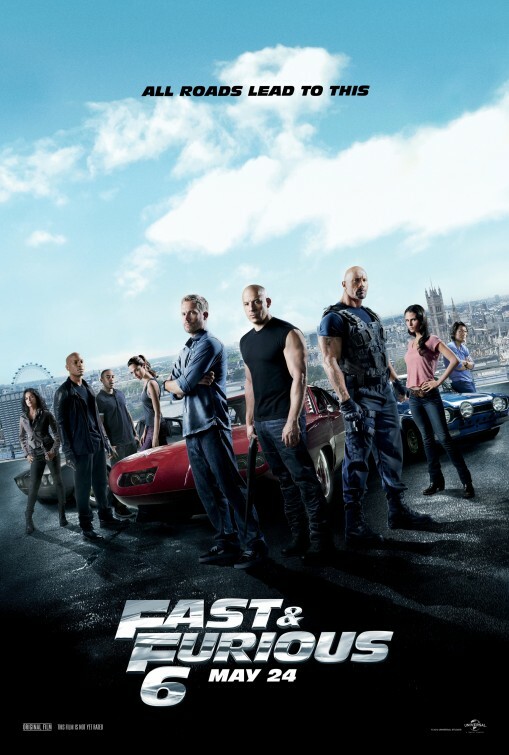 The original gang is finally reunited in FAST 6, as Dominic Toretto (Vin Diesel), the leader of this band of former criminals, is on a mission to find out what really happened to his ex-girlfriend, Letty (Michelle Rodriguez), after the events of FAST AND FURIOUS (2009). The entire Toretto family, biological and extended, may have left their life of crime behind them, but a new threat has Luke Hobbs (Dwayne Johnson), a bounty hunter who once tracked Dom’s gang, coming to Dom and friends for help. Hobbs needs them to assist in taking down Owen Shaw (Luke Evans), a wanted drug trafficker and killer. Shaw’s team may appear more dynamic and prepared than Dom’s but the only real question is who will emerge from the wreckage. Chris Morgan, who has penned the last four FAST AND FURIOUS scripts, brings the series to new emotional heights, as he plays with this now familiar family by exploring the extremes in their dynamics and the intensity in their characters. Unfortunately, FAST AND FURIOUS 6 is a fangasm movie. Without the previous knowledge of TOKYO DRIFT and FAST AND FURIOUS (2009) you may be a little lost. What makes FAST AND FURIOUS 6 something of a love letter to the fans, is that it answers questions that have been pondered for years, connects missing dots, and brings back a strong, enjoyable storyline that was lacking last time out. This may be Lin’s final instalment in the franchise, and he almost single handedly killed it in 2006, but he has certainly finished with a bang. How many sheep would you give Fast and Furious 6? I couldn’t understand how any plane could…. 1) Fly into a foreign country. 2) Attempt a touch and go at a NATO base which is basically another countries military airport in another country. 3) How long was that run way?? 25 Miles? Even the runway the shuttle lands on at NASA was shorter that this mythical runway. 4) Mia’s capture and the return of Torreto’s GF both of these events could have been done better.